Why? I Joined Avon! What’s Your Why?! Become an Avon Rep Today! Why? I Joined Avon! What’s Your Why?! Become an Avon Rep Today! First when I became an Avon Rep June of 2014. I was skeptical about it, because of the bad influence oh Avon has too many Avon Reps, too many competition among reps, you don’t get online sales, & the list goes on and on. But if you listen to all this negative stuff you’ll never get ahead… Always be/stay positive… Discipline and Executing go hand in hand and that applies to what you do in life. The flexibility means you work your business from slow to how fast you want to achieve your goals, “Avon has so many benefits for our Avon reps”. In any business, you start from the bottom up and how serious you are about your Avon business or any business you may be in or start, and how you want to run it for it to be successful. “AGAIN”. I don’t think any business starts from the top, it starts from the bottom and works it to achieve your business goals. TIP FOR AVON REPS AND FUTURE AVON REPS! 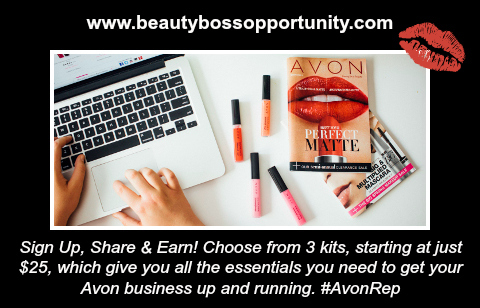 Do you love fashion, makeup, jewelry, skincare, seasonal items, share the Avon opportunity build your down-line meaning your own team, and so much more? Check out the videos below for several tips… Start today by signing up for only $25.00 to start your online business and or face to face ordering at Start Avon Today! My experience to when building your own team is to be ready for it. It’s super important to be ready for it. I feel that if you start selling first to get the feel of it and gain confidence is super important before you go to the next level in building your own team.. But if you have that confidence, why not? Go for it., if you have recruiting experience, or not is achievable & support goes hand in hand when building your own team. Are you already on social media? If not sign-up to all social media networks to start sharing your business like Google + Page, Facebook Page for your business, you can share on your personal Facebook site, but don’t all the time Facebook can shut down your personal timeline, Twitter, Create your blog with Blogger or WordPress, Pinterest, Bloglivin, and so on..
Have a separate email account for your business purpose only! Separate Bank account for business purposes only! See what Avon says about fraud/spams talks about it in your Avon back office, be aware of this. I’ve created a blog for support for my team at TEAM OPTIMISM FOR SUPPORT ONLINE! When you sign-up YOU have to read through everything the more you know the more you grow and how serious you are about starting your own business with Avon. 1. Watch Video 1 by Clicking Here… Make a New Friend. Find Her Beauty Needs. Find Your Next Avon Customer. Independence. Following your passion. Money in your pocket. Whatever your reason, we’ve all got a why that has us looking for more. See how these women like you made theirs happen with Avon. Read Info SIGN UP Choose from 3 kits, starting at just $25, which give you all the essentials you need to get you up and running. Share icon SHARE Hand out Avon brochures to family and friends and put your free Avon eStore to work so your customers can shop with you 24/7. Earn icon EARN Work where you want, when you want and earn 40% on all sales and more than $1000 in the first 90 days with KickStart! Get a quick start to having fun, making customers happy and loving your new business with our KickStart program. Earn 40% in your first campaign regardless of the size of order, compliments of Avon! THIS ONE I HIGHLY RECOMMEND TO DO A $250.00 ORDER OR MORE TO GET EARNINGS OF $100.00 or more. How do I know what my earnings are? *A Qualified KickStart Recruit is a new recruit who has an on-time, paid order of $150 or more during her first or second campaigns (by close of the second campaign). Get all details on YourAvon.com. All new Representatives earn 40% on their first order. If you hit the KickStart sales goals, you’ll continue to earn 40% in your first seven orders, otherwise (and for all Representatives after KickStart) your earnings are based on the chart below. Why do I earn at different levels on some products? Your orders are made up of both variable-earnings products (color cosmetics, fragrance, hair care, personal care, skin care, jewelry and watches) and fixed-earnings products (mostly fashion and home). Variable-earnings items result in earnings to you of between 20% and 40%, depending on the size of your order. Fixed-earnings items are marked with a special symbol ( ) in each brochure. Your earnings level on these products will always be 20%, or 25% for President’s Recognition Program members (more about that here). Do I also receive earnings from customers who shop with me online? Absolutely. Online customers are a great way to build your Avon business and you’ll earn the same on your online store (eStore) sales as you do on YourAvon.com orders. Creating beauty around her and inspiring others. For nearly 130 years we’ve empowered millions like you who are ready to discover the beauty of confidence, financial independence and a life you love. As the largest global network of women Avon is proud to be at the heart of a sisterhood of strength and success. Our world-class products, envy-of-the-industry innovations and unmatched reach and reputation make selling easy. Avon’s award-winning products are worldwide favorites of consumers, beauty editors and industry honors. You probably have a few of these in your bag right now! THIS IS THE COMPANY that puts mascara on lashes and food on the tables. That fights wrinkles with one hand and Breast Cancer with the other. That knows the value of a perfect lip, but still opens its mouth and speaks out against Domestic Violence and for women's financial independence. This is the company that not only brings beauty to doors, but also opens them. The company that supports more than 6 million Representatives in over 100 countries. This is Avon. The company that for more than 125 years has stood for beauty, innovation, optimism and above all for women. It takes just 5 minutes to sign up! Fill out a registration form and choose your tools to set up your online business immediately. Just $25 gets you started and makes you an official Avon independent Sales Representative. What happens after I sign up? You’ll be directed to the New Representative Center – your go-to resource for immediate info and support. Your welcome kit will be mailed to you. You’ll also be contacted by an Avon Leader to welcome you, answer every question, and guide you as you start up your business. Can I earn back my start-up fees within 30 days? Most Avon Representatives do! Simply by launching their business to family and friends, start-up costs are covered – plus earnings. The tools and programs available to a new representative help get you off to a great start. How much can I make selling Avon? Your earnings match your efforts, and your passion. You have the opportunity to grow your earnings as you grow your sales. Build on your success by inviting people into the Avon business and earn on recruiting efforts and team sales. Your success is unlimited! When selling face-to-face, simply collect payment with your Customer's order, then place the order via your New Representative portal online. Products will be sent directly to you to then deliver to your Customers. For your Customers ordering online, through direct delivery, you’ll receive payment and earnings through direct deposit – that’s it! Building relationships is at the heart of our business. Whether it be face-to-face, or online, selling Avon gives you the opportunity to build on the relationships you already have – and help you create new ones. Add to that a love of beauty, a passion for success, and all the amazing support you receive when you become a Representative, and you’re on your way for unlimited rewards and success. Can I be successful selling online only? Yes! Avon is fully integrated in social media so there are tons of opportunities to promote your business through Facebook, Instagram, Pinterest, and more. Plus, Avon has its own mobile APP so you can connect with and grow your client base from your smart phone to make money any time, anywhere! It’s about direct contact with your customers, being your own boss, and having your own business. You can work independently, or with a team. You can work from home and create the work/life balance that’s just right for you and your family. However you choose to sell you’ll be part of a warm, welcoming community of people and beauty lovers just like you. You’ll have the opportunity to choose from 3 great kits to get you started. Every kit gives you full-size products plus samples, brochures, sales tools and more to help you start sharing, sampling and selling like a pro in no time! Favorite products to experience and sell, plus samples and a step-by-step guide for your business and more essentials. 4 full-size products + 10 samples + Getting Started booklet, catalogs/brochures and more. Includes everything from the Quick Starter Kit, plus even more award-winning beauty and skin care favorites your new customers will love. 10 full-size products + 53 samples + Getting Started booklet, catalogs/brochures and more..
16 full-size products + 93 samples + Getting Started booklet, catalogs/brochures and more. Help customers get full-on gorgeous with the ultimate haul of full-size bestsellers and samples: everything from the Quick Starter and Advanced Starter Kits, plus even more. And carry it all in your exclusive Avon tote!